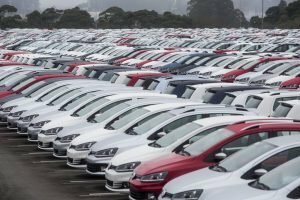 One year ago, sales of new vehicles were still feeling the high of 2017’s record breaking year as January went against expectations to post sales gains. This time around, however, the cold start to the year is a carryover of 2018’s slowdown as sales dropped 7.3 per cent compared to last year. DesRosiers Automotive Consultants Inc. reported that last month’s light vehicle sales came in at 108,774 units – compare that with January 2018’s total of 117,281. That brings the streak of year-over-year declines to 11 straight months. Yet, it was the fourth-highest January ever and more in line with 2016’s figures. “Expectations for the market are relatively dampened going into 2019 and a less-than-enthusiastic January continued the trend seen in recent months,” the consultancy said. However, a true outlook for the coming year will come into picture during the spring selling season, it added. Ford topped the list with 16,154 units sold, taking over from Fiat Chrysler, which tumbled to third thanks to a 20.1 per cent drop from this time one year ago. General Motors, despite the backlash from its plans to close its assembly plant in Oshawa, Ont., finished second but still say a nearly 15 per cent decline in sales. Toyota saw a sales jump of 14.4 per cent to place fourth. Of all 26 brands DesRosiers counts for its sales snapshot, only eight saw year-over-year increases while 12 saw double digits drops.